Is this the end of our relationship American Airlines? I remember the moment you accepted my status challenge. I had been a long time United 1K, but the Premier Qualifying Dollar (PQD) introduction was too much for me, coupled with fewer upgrades, so I bailed. All of my friends said you would be so much better, even if your aircraft cabins weren’t at the same level. I met that status match/challenge with an impromptu trip to India (visiting the Hyatt Delhi and Oberoi Amarvilas), flying on your partner British Airways. It was a 74 hour trip of a lifetime, I still share stories from the trip. It was an amazing start. I had even been successful in convincing my wife to do a status challenge from her United Premier. By the end of 2013, we were both Executive Platinum. A status we coveted and enjoyed for 4 solid years. I even did crazy things to maintain status with you. My wife too! We did date night–dinner, a movie, and a Cairo transit–in February of 2015. It may have been our craziest mileage run ever, I look back on that as amazing fun. In 2014, my wife and I commonly did Date Night, which at the time constituted of round trip flight from DCA to SFO, via DFW. They were painful. The Centurion Lounge in SFO was never open for us, but at least we could rest at the DFW Centurion Lounge each way. I may be getting older, but gosh, I remember those trips as being fun yet exhausting, even with the complimentary domestic upgrades. But things did change. In 2015 you devalued your award chart. I was sad. Many were sad. But we understood. United had devalued their award chart. Delta, well, we’re not quite sure whether they even have an award chart anymore. So we moved on from there. I continued to fly. In fact, my wife and I flew the cycle–sort’ve–closing the deal on our status in 2016. We had a double open-jaw flight from Europe to Brazil where we flew Economy, Euro Business, International Business, and International First. The economy part was tough for me. It took a lot, we burned many more miles than we earned, just to get to and from Europe. On the way home though, I did get Schnitzel, but you didn’t have any part in that one. Then you changed the AAdvantage Program. Like United 3 years before, you instituted Elite Qualifying Dollars (EQD)s. You changed the status paradigm from: “hey, you love to fly us, and you fly a ton, so we’ll reward you.” to “what have you done for me lately?” American, you went from the bigger, wider, global view of loyalty, to a more transactional view. As Gary Leff has said (though I can’t find an appropriate link), I am not my fare, but you now believe I am. I stuck around in 2017. I had my Executive Platinum status anyway, but I’ve found myself wandering. I don’t feel like I’ve cheated on you with Southwest, after all, we have the companion pass, and if you value me by my fare, well, maybe I should value you based on your cost. Southwest was cheaper. I still flew a few dozen flights on your metal, with varying experiences. You should really take care of that. I can tell in the first few seconds on a plane whether it is a Legacy US Airways aircraft, or a Legacy American Airlines aircraft. Wait, I’m not so sure of that last statement, because it seems like so many more aircraft look much more like Legacy US Airways. A lack of personal In Flight Entertainment (IFE). Perhaps I should look to see how many ovens are onboard? We know US Airways had fewer. Really, American, your aircraft don’t really pass muster compared to your competitors. I won’t even let myself get started on your award chart. Yes, you devalued it in 2015, but the amount of saver space you release now-a-days is quite simply embarrassing. The joke within my circles now is that your “lowest level standard” space is the new saver. Every time I look for awards, I feel like I’m being slapped in the face. Another example where you demonstrate that loyalty means nothing to you! The single aspect that I will miss the most about having Executive Platinum status, is your amazing twitter team. I cannot say enough about the cadre of individuals that you have on your twitter team. I’ve been able to upgrade flights while wandering the streets of Taipei, I’ve been able to do things that would normally take 20-120 minutes waiting on the phone, with but a single direct message. If there is a single area that you have continued to do well since the merger, American, it is your twitter team. I wish I could give each and every team member a big hug. They are amazing, and they are your greatest strength. But let’s consider that statement for a second. American, you are an airline, a transport company. Your greatest strength is your twitter team. Really, they are that great, but consider how many other aspects of your business that you are neglecting! We’ve discussed your woeful aircraft interiors. Some don’t even have power, and this is the 21st century. I haven’t made the final decision. There are still 3 months left in the year. Perhaps I’m naive, but maybe you will see the error of your ways. I am holding out hope. But, if you don’t, I have a wonderful JetBlue Mosaic challenge that I plan to make. I’ll also be looking into other status match and challenge offers. I’m not sure, but it could be refreshing to be a free agent again. But really, as I finish off this brief introspection. The saddest part for me, is that we had so much together. I can’t count the number of amazing experiences that we shared together. You were the first US Airline to take on the 777-300ER, and boy did we enjoy it together. To Hong Kong so many times, as well as a flight to Sao Paulo. My only regret there is that I never had an espresso onboard. But you have so much potential American, I truly believe that. But, you, who has one of the oldest Frequent Flyer programs, need to remember those foundations. They economy won’t always be as it is now. Soon, instead of worrying about Voluntary Denied Boarding (VDB) candidates, you’ll be concerned whether you’ll have enough paying passengers to make a flight profitable. That is when loyalty matters most, and what you are doing now, is poisoning the well. So please, consider the value of loyalty before it is too late for myself and so many others. I think we all enjoy double or triple dipping. 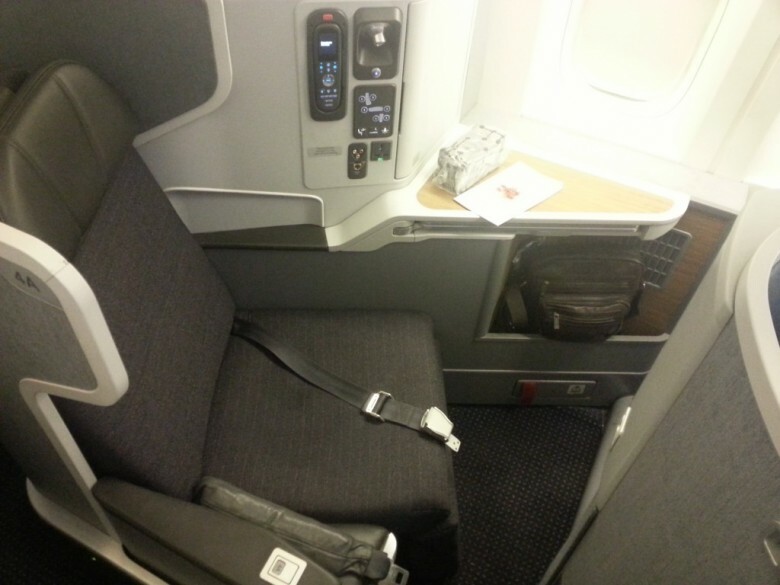 The American Airlines Business Extra program is a way to do that, if you fly on American. That said, if you’ve been using American Airlines Business Extra for a few years, your points earned in 2014 will expire soon! You see, points expire 31 December, 2 years from earning them. As you can see, I’ve got a handful of points ready to expire on 31 December 2016, luckily, though, the majority of my points are good for another year or two. As I look at the amounts per year, it definitely seems like I’ve been spending more and more with American over the last couple of years. It’ll be interesting to see how that changes next year with the new AAdvantage changes. I for one, will be getting a few Admirals Club passes myself. In fact, regular readers might even see a give away when the Admirals Club passes actually arrive to Tagging Miles HQ! Just be advised, they actually mail out the passes, so, make sure you have enough time to receive them. Full disclosure – I have not tried to use any of the other awards, like domestic or international, so if anyone has any experience with how readily available those are–considering how stingy American is with saver awards–, please share in the comments. 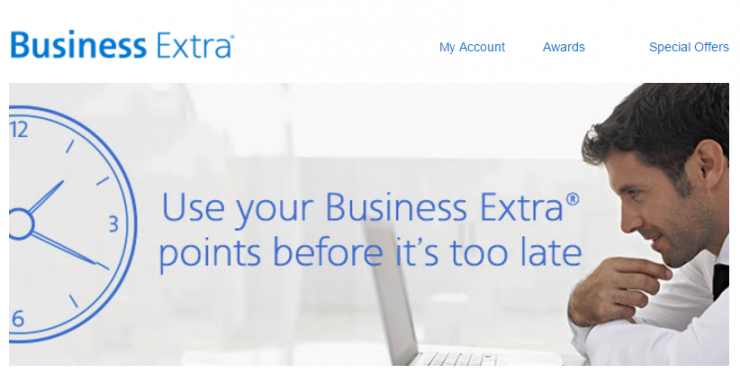 How many American Airlines Business Extra points do you have expiring? American Airlines continues to release AAdvantage Program Updates, as we move toward the “go live” of a few new aspects of the program, previously announced in June. AAdvantage RDM earn rates as of 1 August 2016 – courtesy of American airlines. Of course, we’ve learned subsequently that there are a handful of ways that you can accrue mileage based on miles flown, rather than the price of your ticket. For example, revenue tickets booked with Citi Thank You Points (TYP) categorize as a “Special Fare” and receive miles flown. American AAdvantage previously made this chart available, highlighting their new mid-tier Platinum Pro, which will no doubt make many legacy US Airways elites happy. 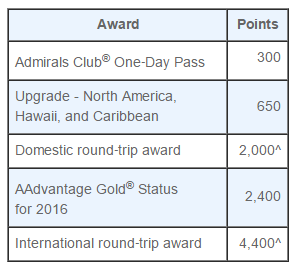 Four AAdvantage Status Levels in 2017. Courtesy of American Airlines. Except that when talking about upgrade windows, AAdvantage snuck in the ConciergeKey level, as essentially another level of status, at least for upgrades. Time will tell, as to how much more information will become publicly available about ConciergeKey membership, but I think we’re seeing the early vestiges of a 5th status level. 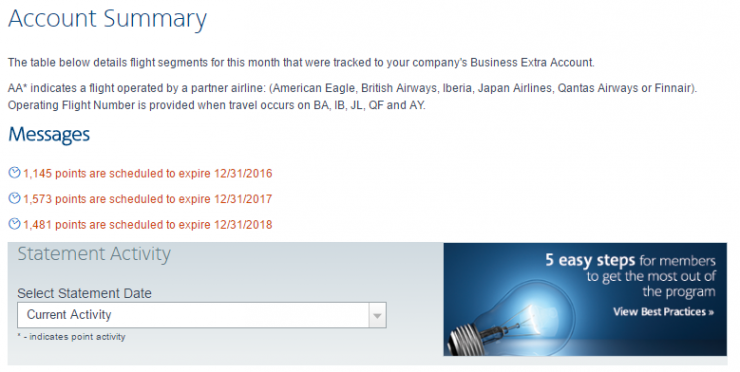 Elite Qualifying Dollars (EQD) – The best part of these AAdvantage Program Updates! 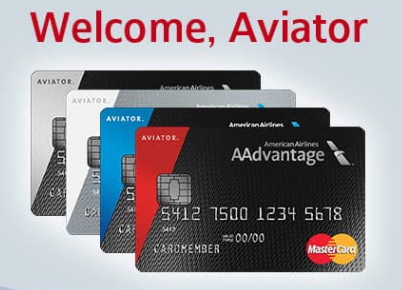 The interesting piece that AAdvantage highlights in the most recent update, is that it is possible to earn EQDs by spending with their AAdvantage Aviator Red, Blue, Business, and Silver cards. These are all issued by Barclays, however, not currently taking on new applicants. Gary Leff reports that will change. I find it very interesting, that Citi, who has long had a very strong co-brand partnership with American, has absolutely no play in the EQD game. Recall that American did not make an exclusive credit card deal the last go-round, I assumed this was just a negotiating strategy. But for Barclays cardholders to be the only ones to accrue EQD’s through spend, that, sends quite the message to Citi, and not a good one. 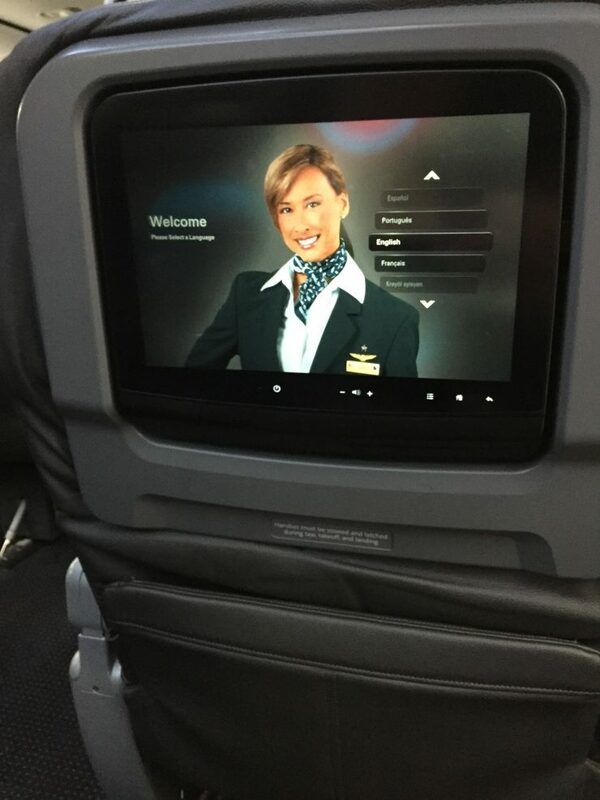 American’s AAdvantage Program Updates are mostly positive, in my opinion. They’ve clarified things where we definitely had questions. American has also provided more insight into ConciergeKey, though I think there are still questions, as it starts to become as public as United’s Global Services. The real positive here is the way to earn Elite Qualifying Dollars (EQDs) through spend on your Barclaycard Aviator cards. I think this is a huge positive, but it leaves open the big question: What about Citi AAdvantage card holders? I suppose only time will tell, whether Citi balks at this slight, or if there is something bigger in the works. What do you think about the updates? Does the EQD announcement change your strategy for next year? Ed and eBags are giving away $800 of the best luggage around. It’s my preferred carry-on too. A new trans-atlantic route – Hartford, Connecticut’s Bradley Airport to Dublin. Qatar introduces 96 hour free transit visa. Doctor of Credit reports on a rumor that American Express may try to compete with the Chase Sapphire Reserve. It could be as early as Q4 (which starts in 3 days..). This could turn into a very lucrative year for folks in the miles and points game! MJ on Travel is making a change. We wish him well, and will certainly look for him on Travel Update. Matt’s got a great post on ROI and when you should and shouldn’t use it for decision making. Matt had another post income tax, of particular interest is the impact inventory does (or rather does not) have on it. A discussion on long tail products. Oren shows how he made a significant return, and he only had to hold the product for 7 months. Its not bad for a subset of products, but too much would tie up capital for too long. 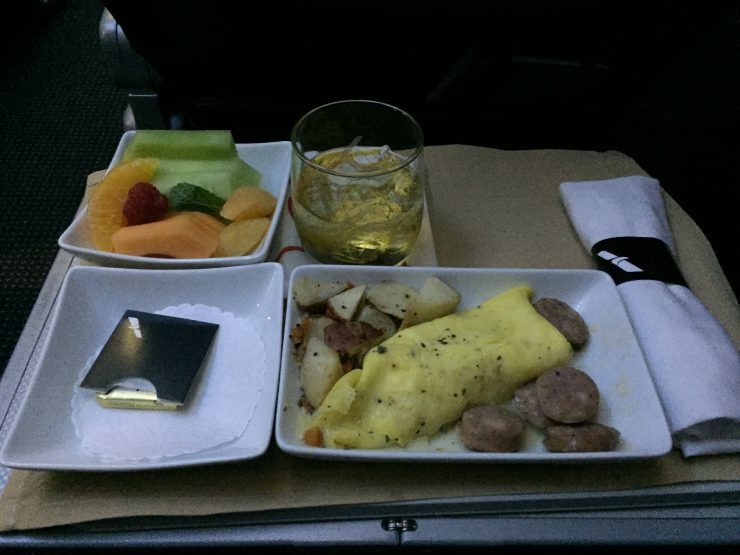 I burned two American Airlines Systemwide Upgrades for Business Class on an Embraer 175. Could Basic Business Be Coming? A couple of weeks ago, following ResellingDO, my wife and I had a 0600 flight to Miami, with a continuing flight on to Liberia, Costa Rica. 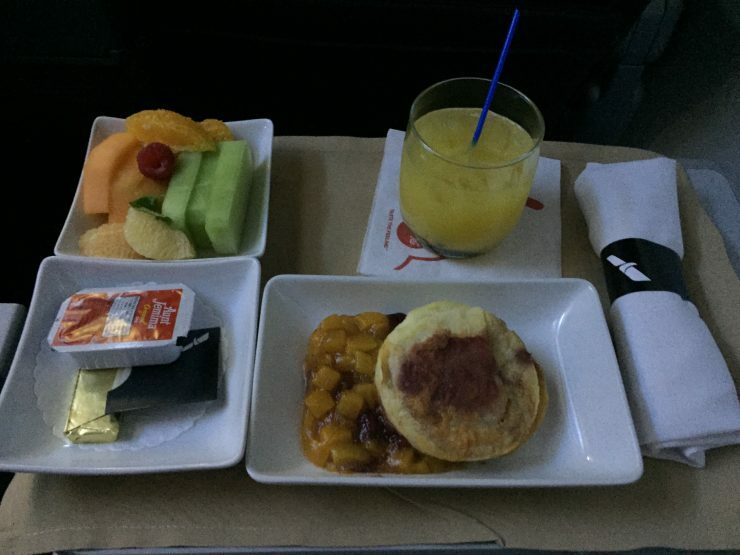 The upgrade on the DCA-MIA was at risk, given it was a Monday morning, and it was not clear to me, whether or not the Miami-Liberia flight was truly a complimentary upgrade. So when faced, with burning 2 (of only 4, as I’ve used all of mind for 2016) systemwide upgrades (SWU), which I received by requalifying for Executive Platinum status, I bit the bullet and did it. Our first flight was nothing too special, however, our 737-800 was equipped with seatback In Flight Entertainment (IFE), which was a nice treat. As a result, I got to enjoy 95% of the new X-Men: Apocalypse movie. Having not seen the end, I found it to be interesting. The idea of rebooting a movie series through time travel seems to always make things interesting. The meal was your run of the mill eggs or French toast frittata. I enjoyed the frittata, but, it wasn’t really the type of breakfast you write home about. This was a first for us, we were flying out of D60Q. The D60 gates are affectionately referred to as “Ghetto Gates” by some we chatted with. You have to go down an escalator, you wait in a holding pen, then are released to an open air (but covered, thankfully) maze, where we then waited another 10-15 minutes to be permitted to board the plane. The seats were more than sufficient for a sub-three hour flight, though I would have liked IFE. The meal was cold. 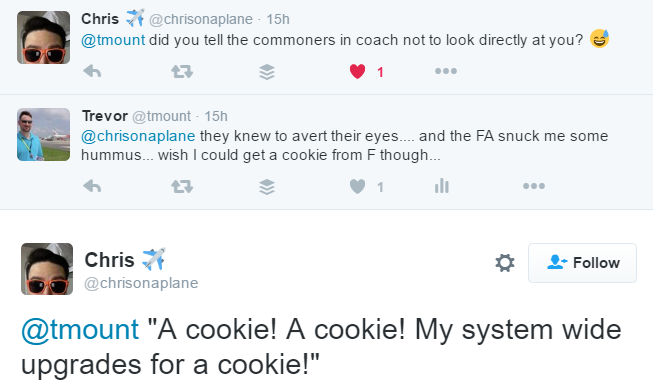 I was concerned about this, primarily, because it was a mid-day flight, and I was quite hopeful for a cookie. I do like American’s cookies (though the older ones were better than the newer ones, but I digress). Alas, there are no ovens on the E175’s, so all was cold, and no cookie. 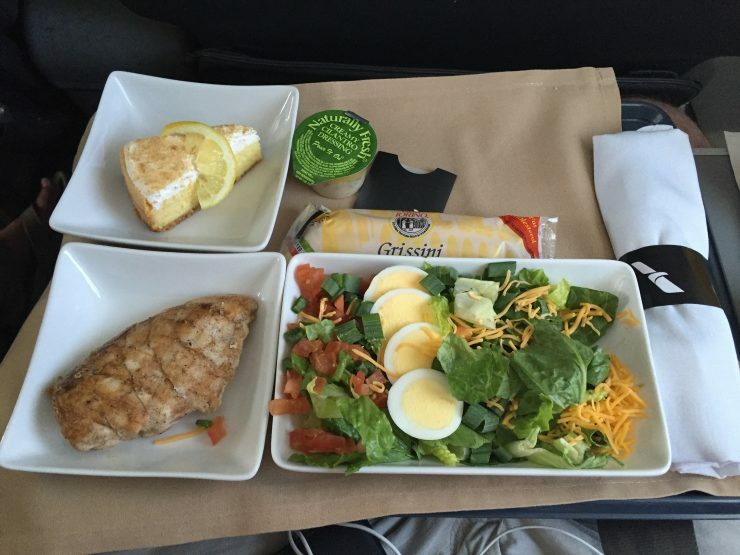 The options were a market salad with a side of chicken, or a curry chicken wrap. Bonus for the Salad with a side of Chicken were the little Grissini bread sticks. The lemony pie was great too. Ultimately, we were quite happy to have been confirmed in the pointy end of the plane, given the busy weekend. It didn’t help that I was fighting a cold too. I think if faced with this sort of situation again, I might not burn a SWU, but, I am glad I did this time. Interestingly enough, on the flight home, we received our complimentary upgrades at the gate in Liberia, at least to get to Miami, no SWU needed. 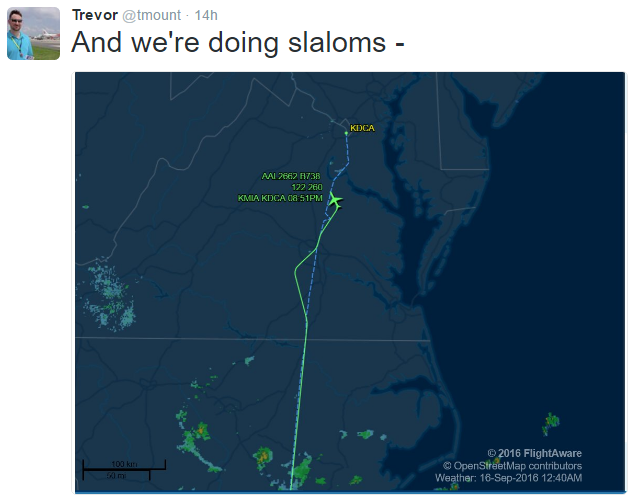 Of course, the flight from Miami to Washington, DC was an entirely different story. As many know, I generally avoid flying in the back of the plane. 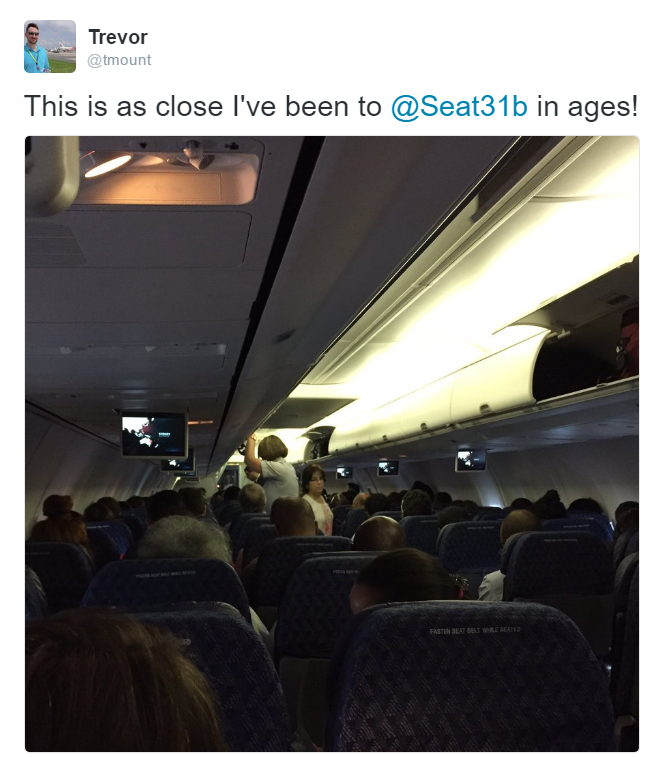 I leave that to other experts, such as Seat 31B. Nevertheless, yesterday I was glad to have a seat on a flight 2 hours earlier, thanks to a nice benefit for American Airlines Executive Platinum members. 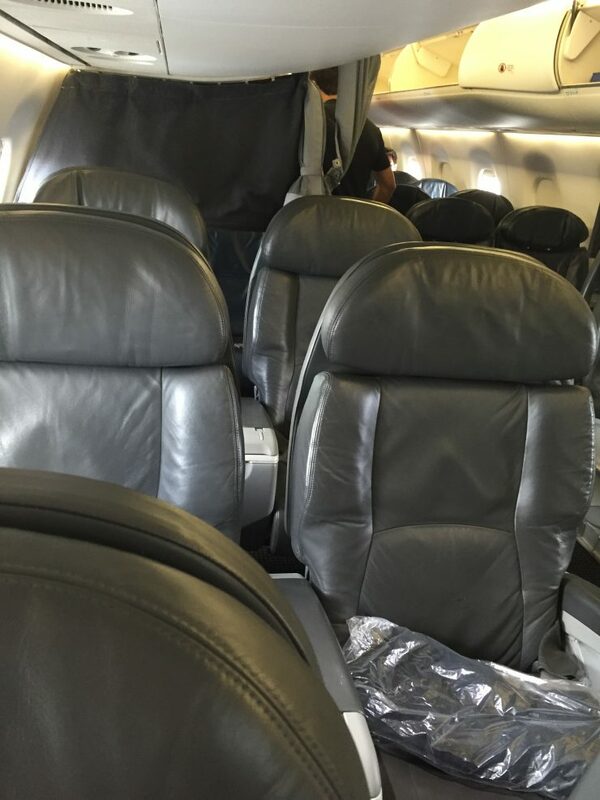 What follows is my attempt to share my experiences – Tales from Seat 28B. It all started with an early arrival on our flight from Liberia, Costa Rica. Needless to say, we made it, and as an added bonus, to further give us the “back of the plane” experience, the gate agent was gate checking bags. About this time, folks on twitter started noticing that something was amiss, and had some fun. About mid-way on the flight, things were getting a bit intense, so I had to turn to twitter to share my experiences. A little further through the flight, I was starting to question humanity. Or rather, how long a baby can cry for, non-stop. Luckily, there are not often crying babies in business or first class, so, I had no previous data points to go on. I think the pilots were having fun too, as we were doing a little slaloming, I assume to help slow us down, since we had a relative direct shot approach, which was a first, and very much appreciated. We landed, and even had a gate. This was a first for me, when flying American Airlines into Reagan National. Of course, I was left sitting on the plane, as the gaggle of people in front of us took their time to deplane. I never realized how long it takes a plane to empty out. I mean, I did, but, its been years since I was actually one of the last dozen people off. Of course, my good friend Joe Cheung said this was incoherent. I don’t know how you get more descriptive in 140 characters. The dude in 27A was wearing an aloha shirt, and my attempt was to say that we walked over him to get off the plane. Of course, this was total tongue in cheek and kidding around. I was happy to be off the plane, and made a break for it. So there you have it folks – tales from Seat 28B, a seat that I hope not to frequent, but I was sure happy to be home 2 hours early! I’ve been an American Airlines Executive Platinum for a few years now. 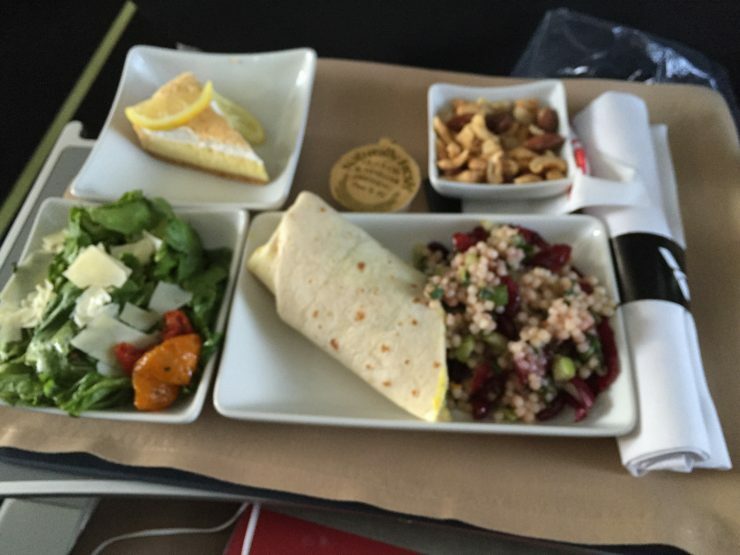 Ivy enjoyed a bunch of the benefits, like complimentary domestic upgrades, and no charges for redepositing award miles. But the benefit that I find especially valuable, is the ability for same day standby. Now, don’t get me wrong, American devalued this benefit significantly a couple of years ago. It used to be that as long as you got to your ultimate destination, you were good. Now it has to be the same exact routing, which I think is a significant challenge. Anyway, I write this from seat 28B, enroute to DCA. 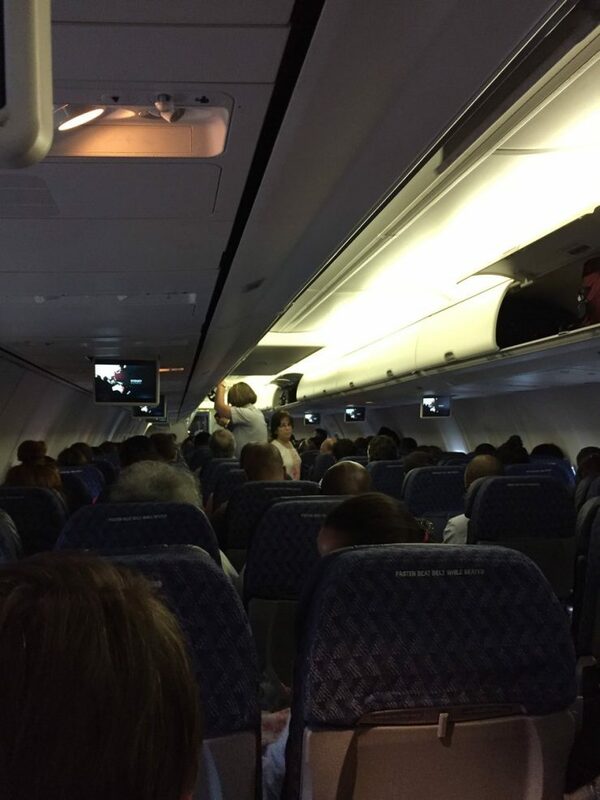 My wife and I are on our way home from Costa Rica, and our flight got into Miami early. Not crazy early, but early enough. We landed at 5:40, and the flight we wanted to make was a 6:30 departure. Of course, we needed to get bussed to the terminal, then walk half a mile to the tram, then get through customs, and security, then walk another half mile to the gate. We ultimately got to the gate about 6:12 or so. The gate agent told my wife no (she is in better shape and faster than I am, something I am trying to change). I got up there and said that I saw there were empty seats on ExpertFlyer, probably not the best thing to say, but my brain was operating on less oxygen than it is used to. Then it occurred to me, that this could be one of those times to make it known that we were both members. The gate agent grumbled a little, but started taping at the keyboard, as I was pulling out my iPhone, either to check ExpertFlyer again, or DM the @AmericanAir twitter team. I honestly don’t know. A few moments later, we had our boarding passes, for 28B and 28E. I’m not used to being this far back, but, boy am I happy to get home two hours earlier! Wow, I can’t even see the First Class cabin from here!